A more healthy, whiter, beautiful smile will not only make you more attractive, it will also boost your self-confidence, make you happier, and literally add a few years to your life. Dr. Wieland combines the latest technology with a thorough understanding of dental anatomy to give you the warm, engaging smile you’ve always wanted. If you’d like to change the appearance of your mouth, teeth and smile, connect with us today to discuss a variety of options, from simple color correction to replacing missing teeth. Your perfect smile is just a phone call away. Cosmetic dentistry typically involves elective treatments and focuses on improving the overall appearance of your mouth, teeth and smile. Common procedures range from the relatively simple, such as teeth whitening, to more complex dental care such as implants that require specialized expertise. Who should consider Cosmetic Dentistry? A more healthy, whiter, beautiful smile will not only make you more attractive, it will also boost your self-confidence, make you happier, and literally add a few years to your life. If you have questions about cosmetic dentistry and how it can change your smile and your life, schedule a smile design meeting today. Dr. Wieland will examine your teeth, gums, and bite, and discuss a variety of options to achieve a more beautiful smile. 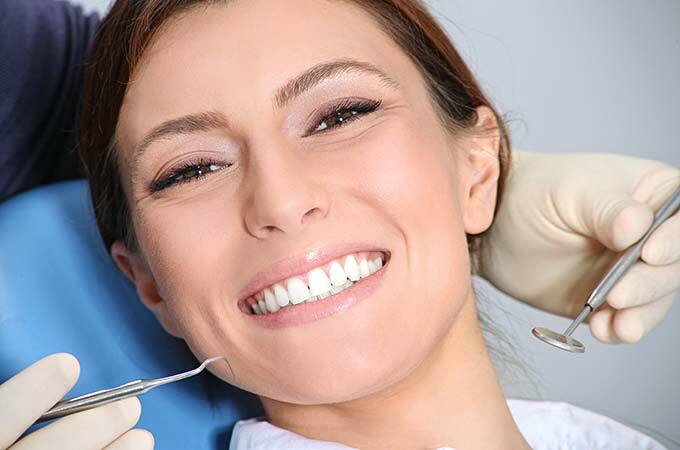 What Cosmetic Dental procedures are offered? Cosmetic Teeth Whitening: Over time, nearly everyone’s teeth become stained and worn from food, drinks, medication and personal habits such as smoking. A professional teeth whitening treatment can restore your teeth to their natural appearance while boosting your self-confidence and making you look more attractive and even younger. Tooth-Colored Fillings: Tooth-colored fillings, sometimes called white fillings, are dental fillings that more naturally mimic the look, feel, and function of your natural teeth. The tooth-colored fillings is made of a strong composite resin that bonds directly to the enamel and dentin (the bony tissue just beneath the enamel) of your tooth and provides a durable, long-lasting solution – a solution so strong you could bite into hard or crunchy foods without damaging your dental work. Inlays and Onlays: Dental inlays and onlays are restorations used to repair rear teeth with mild to moderate decay or cracked and fractured teeth that are not sufficiently damaged to need a crown. An inlay, which is similar to a filling, is used inside the cusp tips of the tooth (the bumps on the top of a tooth). An onlay is a more substantial reconstruction, similar to the inlay but extending over one or more of the cusps of the tooth. Veneers: Porcelain veneers are placed on the surface of your teeth and are indistinguishable from the rest of your real teeth. Veneers can be used to correct a wide variety of dental flaws, such as chipped or broken teeth, misaligned teeth, and severe staining or discoloration. Lumineers: Lumineers are similar to veneers in that they are placed on the surface of your teeth to correct dental flaws. One advantage of Lumineers is that we don’t need to remove healthy tooth structure to prepare your teeth. This means that Lumineers can be taken off at some point in the future, if necessary. Crowns: A crown is a dental restoration that is used to cover a tooth that has been damaged by decay or injury. All-porcelain crowns are a vastly preferred alternative to metal crowns because they look and feel like your natural teeth, and their durability makes them a long-lasting choice for the front teeth that show when you smile. Fixed Bridges: As its name implies, a porcelain fixed bridge replaces missing teeth by using the surrounding teeth as anchors on either side of the gap to create a literal bridge made of a porcelain, artificial tooth. A fixed bridge will not only restore your beautiful smile, it will support your facial tissues for a more youthful look, and help prevent the remaining teeth from shifting.